Looking back on the past year, the first thing that comes to my mind is the plight of the many people who are facing difficulties due to the severe economic conditions in our country, triggered by the global financial crisis. It grieves my heart that there are people who have even lost their homes. In autumn, there was an increase in the number of patients infected by the new strain of influenza H1N1, whose spread had been feared since May, and I am concerned as to how the situation will turn out in the coming year. I am hoping that preventive measures such as the implementation of the flu vaccine will prevent a pandemic. This year, more than 60 people lost their lives in natural disasters such as torrential rains and typhoons. I can only imagine the feelings of those who lost family members, and my heart goes out to them. This year marks the 50th year since the Ise Bay Typhoon, which claimed more than 5,000 lives. I recall with a heavy heart how I looked down on the flooded disaster areas from a helicopter, and the stories I heard from the mayor of Nagashima town, which was damaged from the flooding of the Three Rivers of Kiso, the Kiso River, the Nagara River and the Ibi River. In recent years, forecasts of torrential rains and typhoons have become more advanced and detailed, as have the results of soil conservation and flood prevention measures implemented up until now, decreasing the number of victims lost to disasters. However, I regret that dozens of people still lose their lives in disasters every year. It is my hope that those responsible for disaster prevention continue to make efforts and that public interest in disaster prevention will increase further. The lay judge system was implemented this summer. Shortly after the Second World War, I heard from Mr. Shigetoh Hozumi, the Grand Master of the Crown Prince's Household at the time, who later became a justice of the Supreme Court, that Japan once implemented a jury system for a short period in the early Showa era. However, it seems that this system was not suited to Japanese society at that time. Unlike that previous jury system, in the lay judge system implemented this time, representatives from the general public participate in trials together with the judges. I would like to watch over this system with anticipation and hope. In July, the Empress and I visited Canada on the invitation of the Governor General of Canada. I myself had visited Canada 56 years ago, on my way to Britain to attend the coronation of Her Majesty Queen Elizabeth II. This was before my marriage when I was only 19 years old. During our visit this time, observing how Canada has developed while protecting both its wonderful environment and the people of various ethnic backgrounds who live there, I feel we were able to deepen our understanding of the present day Canada. I would like to offer my heartfelt thanks to the Governor General of Canada, who welcomed us warmly, as well as to the people of Canada, who made this visit such a heartwarming experience for us. At the beginning of December last year, I fell ill and my birthday was celebrated during my recovery period. I am grateful to the many people who expressed their concern for me. Consequently, I spent this year with a slightly lighter schedule and fewer functions. My health is now better than it was last December, and I would like to spend the coming year as I did this year and I will try not to give people cause for concern. 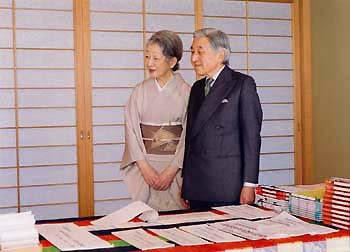 This year marked two milestones, the 20th anniversary of my enthronement and our 50th wedding anniversary. I am deeply grateful for the congratulations I received from many people on the occasions of our 50th wedding anniversary in April and the 20th anniversary of my enthronement in November. In the last 20 years, the people of Japan have overcome many difficulties. I am deeply moved to see the people coping with a rapidly aging society and helping one another, as they work towards creating a better society. As we carry out our everyday duties, the Empress and I feel much happiness that we are supported by these people.